Sundal is a kind of South Indian evening snacks made with Dry beans aka Legumes (not to mistake with the French word, in French 'legumes' means 'vegetables'). Sundal are made especially during Navarathiri festival, which calls for 9 days of celebrations. However we doesnt need any reason to dish out this protein rich snacks to feed our loved ones with less efforts. Actually sundal is prepared easily with cooked beans like chickpeas, black-eyed beans etc which is simply tempered with usual tempering spices and flavored with curry leaves. Though some sundal preparation calls for some exclusive spice powder in case if you want to prepare the sundal with a twist. 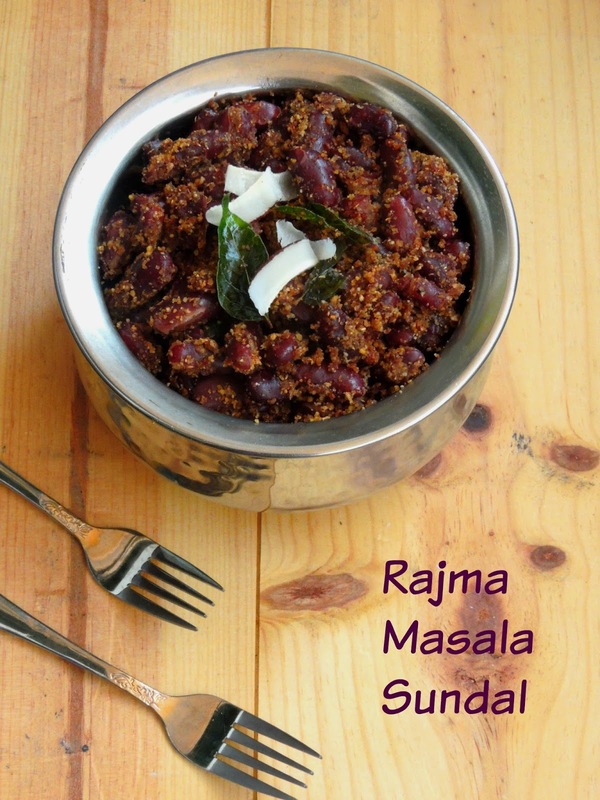 My today's post in one among those sundal with a twist, since rajma aka red kidney beans doesnt tastes like other legumes, its better to toss it with a spice powder to make the sundal preparation more interesting. Actually the spice powder is prepared simply by dry roasting few spices and dal which is later grinded as fine powder. The addition of this spice powder turns the usual sundal as masala sundal or Podi potta sundal. But my today's sundal is masala sundal hence this sundal spice powder calls for some cloves, cinnamon stick, dry coconut aka kopra pieces. Also ginger and crushed garlic is also added to the tempering. This makes the difference from usual sundal preparation. Am sending this nutritious, filling and wholesome sundal to this month's mega marathon am running for this whole month. Am blogging with 5 ingredients for 5 weeks as theme and i picked a Dry bean/Legume for each week. This week's dry bean is Rajma/Red kidney beans, hence am posting this healthy evening snacks as the last post of this mega marathon. Hope you all enjoyed 26 different bean based dishes during this Mega marathon. Dry roast all the ingredients given under 'to grind' and grind as fine powder. Heat enough oil in a kadai, add the mustard seeds, urad dal and curry leaves, fry until they turn brown. Add the grated ginger, crushed garlic and cook until a nice aroma comes from. Now add the cooked beans,salt, grinded spice powder and cook everything in simmer for few minutes. Once the red kidney beans gets well coated with the spice powder, put off the stove. Masala rajma sundal looks delicious. I am not a big fan of rajma and have a bag of rajma. I this is going to be the other recipe I want to try. Thanks for sharing. I usually add just coconut to sundal. This spice powder sounds so yum and spicy.. Guess the spice powder makes already yummy sundal more flavorful. The spice powder shall make this sundal delicious..very interesting flavors..you have rocked with your different beans..kudos ! Love this masala flavoured sundal! 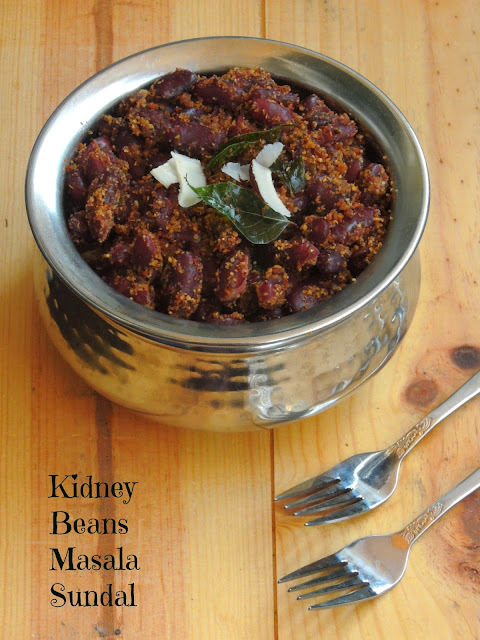 Healthy and tasty snack recipe with red kidney beans.. Looks awesome, Akka! Masala sundal sounds and looks really delicious. Would love to try it soon.Wonderful series in the carnival. I do not like sundal much but can have this kind of masala sundal for sure. 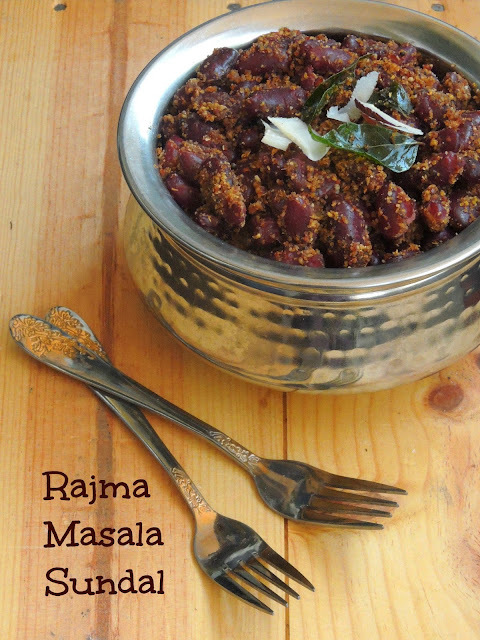 flavorful and tasty rajma sundal. looks yummy!! OMG, that is such a flavorful sundal, Priya. Healthy & delicious red kidney bean sundal. The sundal looks really great!! Enjoyed this week and the entire series from your space! Wow what a lovely way to end the series. I thoroughly enjoyed your protein rich series..fantastic efforts and so many new dishes to cook now! One more recipe that I have never thought of. Lovely sundal. Wow looks yum and sounds delicious.